Quickly clean-up leaves, grass, dirt and even light snowfall with the Snapper® Gas Powered Handheld Leaf Blower/Vac. 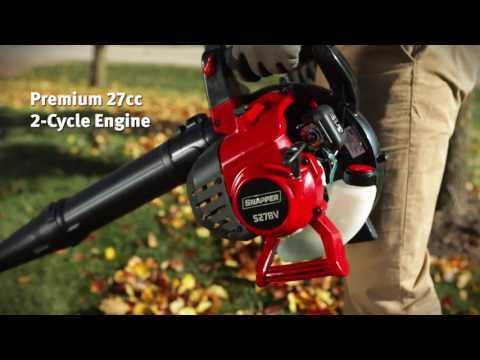 Featuring a premium 27cc full crank engine, you can easily clear debris with up to 450 CFM and 205 MPH speeds. Comfortably blow debris for hours with the cordless leaf blower's ergonomic trigger handle and convenient cruise control feature, or use the vacuum kit to mulch debris and deposit it in your desired location. Premium compact 27cc, 2-cycle full crank engine provides maximum power and low vibration.